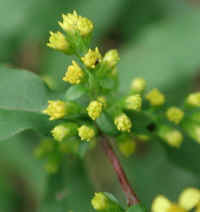 (Blue-Stemmed Goldenrod (Solidago caesia) - 01) Blue-stemmed goldenrod bloom from August to October, and are usually found in clumps where they grow from a caudex. 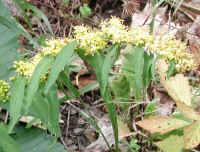 The most distinguishing characteristic of the blue-stemmed goldenrod is its blue colored stem, which led to its common name, and which is sometimes written as "bluestem". 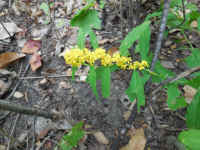 The blue-stemmed goldenrod usually grows in woodland clearings or along the edges of the woods, which is why this wildflower is sometimes called "woodland goldenrod". 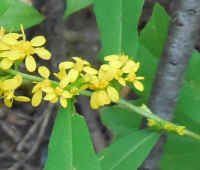 The other common name, wreath goldenrod, presumably was derived from the way this goldenrod grows in a curved arch with flower clusters (racemes) growing from leaf axils along the stem. 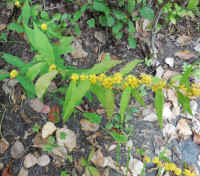 The uppermost racemes are usually blooming by the time the lower ones develop, as with the blue-stemmed goldenrod in this photo. (Blue-Stemmed Goldenrod (Solidago caesia) - 01a) In this photo we have a closer look at the uppermost flowering racemes of a blue-stemmed goldenrod. 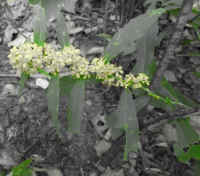 Note that the further down the stem we look, that the flowers are less and less developed. 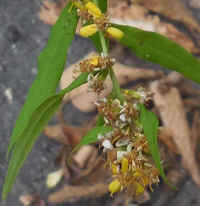 Each individual flower is only about 1/16 to 1/4 inch long. (Blue-Stemmed Goldenrod (Solidago caesia) - 02) In this bee's eye view of a few of the flowers of the blue-stemmed goldenrod, we can the complexity of the design created into each tiny flower. (Blue-Stemmed Goldenrod (Solidago caesia) - 03) This is a close up look at the developing flowers growing on the blue-stemmed goldenrod. The distinguishing bluish colored stem can be clearly seen. 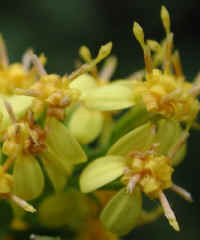 The flowers of many species of goldenrod grow in a secund arrangement, meaning that the flowers face in one direction. 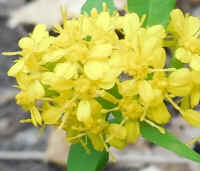 The flower arrangement of the blue-stemmed goldenrod are not secund, meaning that they grow completely around the raceme, which can be partially seem in this photo. The flowers of the blue-stemmed goldenrod are composite, meaning that what appears to be a single tiny flower is really a composite of even tinier ray and disc flowers. Each of these seem to have five outer linear ray flowers and five central round disc flowers, all just opening from their bud stage. 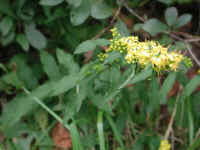 (Blue-Stemmed Goldenrod (Solidago caesia) - 04) Blue-stemmed golden rod are of medium size and usually grow from one to three feet high, but because of the way they often arch over, they may appear to be shorter. 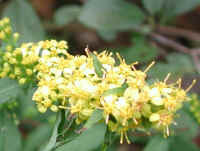 Blue-stemmed goldenrod are members of the Aster family (Asteraceae). (Blue-Stemmed Goldenrod (Solidago caesia) - 05) The leaves of the blue-stemmed goldenrod are narrowly lanceolate with a single feather shaped veining. We have also observed that some of the lower leaves are somewhat broader and toothed. 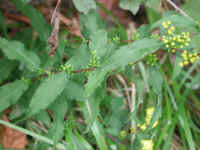 (Blue-Stemmed Goldenrod (Solidago caesia) - 06) In this photo of the blue-stemmed goldenrod, we can see the more typical narrowly lanceolate leaves, with flowering racemes growing from the leaf axils. 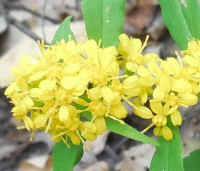 The arched flowering stem give the appearance of a portion of a wreath, which depicts how this wildflower also became know as wreath goldenrod. (Blue-Stemmed Goldenrod (Solidago caesia) - 07) This is another photo of the blue-stemmed goldenrod. 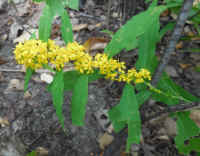 In our area, this species of goldenrod is relatively uncommon, but when you come upon it, its bluish colored stem, narrow lanceolate leaves, each with a single feather vein pattern, and flower clusters growing from the leaf axils all along the stem, make the blue-stemmed goldenrod easy to identify. 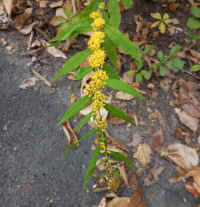 (Blue-Stemmed Goldenrod (Solidago caesia) - 08) In October 2015, we saw this blue-stemmed goldenrod arching out over our driveway. We found it interesting because the flowers developed from top to bottom, so that we can see some of the flowers already going to seed while new flowers are developing. (Blue-Stemmed Goldenrod (Solidago caesia) - 08a) On the end of the stem we can see how the flowers have faded and are going to seed. (Blue-Stemmed Goldenrod (Solidago caesia) - 09) This is another look at a blue-stemmed goldenrod. 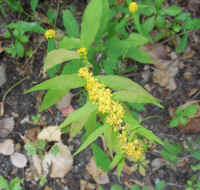 There is another species of goldenrod that have axillary clusters of flowers like the blue-stemmed; it is Zigzag Goldenrod (Solidago flexicaulis), but that species has much broader leaves, which are about 1.25 inched across. (Blue-Stemmed Goldenrod (Solidago caesia) - 10) This is another look at a blue-stemmed goldenrod that was growing on the side of our driveway. 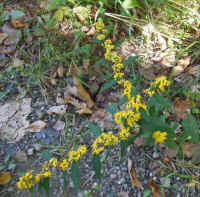 (Blue-Stemmed Goldenrod (Solidago caesia) - 11) This is another look at the blue-stemmed goldenrod that was growing along side of our driveway. (Blue-Stemmed Goldenrod (Solidago caesia) - 12) The stems of these blue-stemmed goldenrods are mostly green, but toward the root end of the stem they appear to be getting a blue tinge. 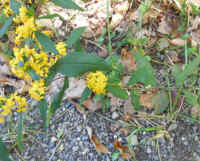 (Blue-Stemmed Goldenrod (Solidago caesia) - 13) This is another blue-stemmed goldenrod that we found growing in our wooded front yard. (Blue-Stemmed Goldenrod (Solidago caesia) - 13a) The flower clusters are so thick toward the base of the stem that the color of the stem cannot be seem. 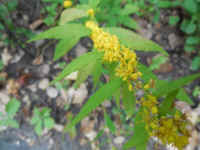 (Blue-Stemmed Goldenrod (Solidago caesia) - 13b) As we look toward the upper or growing end of the stem, we can observe new flower clusters developing and the bluish tint of the stem color. (Blue-Stemmed Goldenrod (Solidago caesia) - 14) This blue-stemmed goldenrod may not be in a complete wreath shape, but we can plainly see the nearly half circle arch in this photo. (Blue-Stemmed Goldenrod (Solidago caesia) - 14a) This is a close up look are some of the blue-stemmed goldenrod flowers. 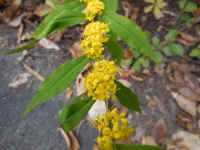 (Blue-Stemmed Goldenrod (Solidago caesia) - 15) This is another view of a blue-stemmed goldenrod. (Blue-Stemmed Goldenrod (Solidago caesia) - 16) In this photo of the blue-stemmed goldenrod we can see more of the bluish tint in the stem. (Blue-Stemmed Goldenrod (Solidago caesia) - 17) In this photo, we can see a few blooming stems of the blue-stemmed goldenrod. (Blue-Stemmed Goldenrod (Solidago caesia) - 18) This is another view of some blue-stemmed goldenrod.